The ideal vacation to Namibia, Botswana, and Victoria Falls will take ~2 weeks plus traveling time. Most tourists will need to fly through Johannesburg to arrive in Windhoek. If tourist left NYC on Thursday night, they would arrive in Windhoek on Saturday night. You need to leave on Thursday to catch the appropriate flights. You would arrive on Monday. We could also stop in Mariental to get gas near the Southern Kalahari region. It is known for Ostrich farming and base for the limited attractions in Southern Kalahari. 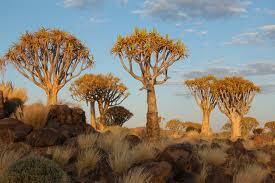 Stop at the Quiver Tree Forest, which is 14 km north of Keetmanshoop. This is 6 hours and 40 minutes from Windhoek. Best Time to Go: The best time to hike in the Fish River Canyon is in the winter from May to September. 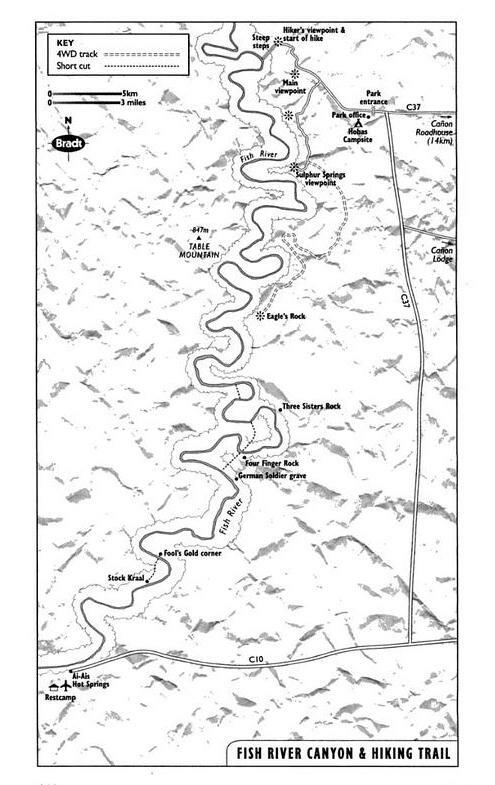 Activities: The primary hike is a 5 day / 85 km hike from Main Viewpoint (Hell’s Bend) to Ai-Ais that will only be done by people with a lot of time. Most people tend to drive along canyon rim and stop at the different viewpoints. It is best to stop at the main viewpoint for sunrise or sunset. You can then head 3 km south to the Hiker’s viewpoint, which is the start of the 85 km hike to Ai-Ais. You then can drive 7 km along D324 to Sulphur Springs (Palm Springs) viewpoint. This supposedly can be reached with a 2 WD vehicle, but it is bumpy. You can continue further south to Eagle’s Rock viewpoint another 12 km, but you will need a 4×4 vehicle. You can drive to Ai-Ais (bottom of 85 km hike) after hour drive. The views in Ai-Ais aren’t as spectacular, but there is a hot spring in town. According to Tourbrief.com, day hikes into canyon from Hobas (main view point) and Ai-Ais have been discontinued due to safety concerns. How much time so spent at Fish River Canyon? : While it is difficult to get a definitive answer, most people / organized tours appear to only spend a couple of hours at the Fish River Canyon, which seems accurate if hikes aren’t really available. The road towards Helmeringhausen is arguable one of the most scenic roads in Namibia. Duwisib Castle could be stop for a short pit stop. The main attraction is driving around to the different dunes and potentially hiking up (e.g., Dune 45) for sunrise. Dead Vlei is known for dead tees with the backdrop of the dunes. These are best explored in the early morning before the dunes get hot. You can also visit Hidden Vlei, which can be reached by hiking over a dune from the 2 x 4 parking lot. 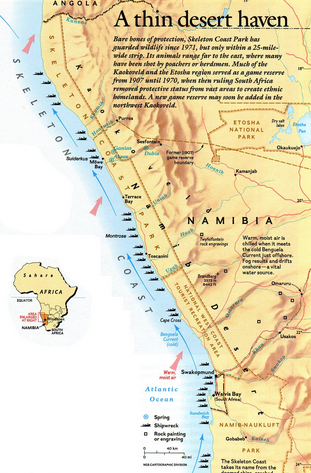 It is also possible to do flight over Sossusvlei from Swakopmund or Walvis Bay. There is also hot air balloon rides from Sesriem, but they are very expensive at 3500 – 4000 NAD ($300 to $400 USD per person). 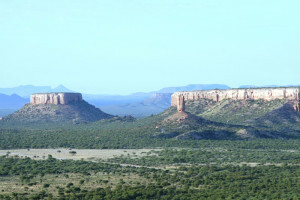 One should also make sure to stop at Sesriem Canyon that is located just north of Sossusvlei. It is often visited late morning or in the afternoon when visitor is not in Sossusvlei. It is reached by following the gravel road from the Sesriem office. It was also suggested to stop at Sossuspoort lookout, which is 24 km from Sesriem, and Elim Dune. How do we get there? : You can utilize a 2 WD vehicle to take you most of the way. You will need a 4 WD to take you the last few KM. There is also a shuttle that can take you the last few KM. 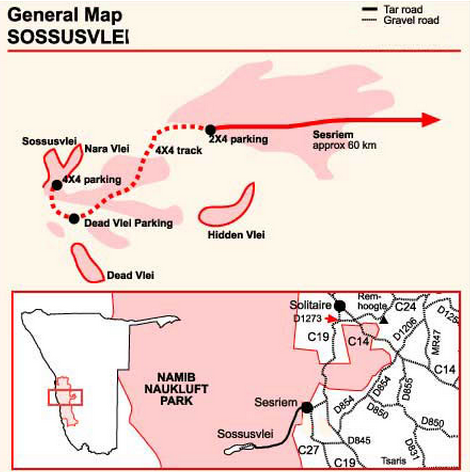 How long do spend in Sossusvlei? : Most people seem to indicate 1 full day and 2 nights is enough. The recommendation is to get there early for hike up the dune for sunrise. You then go in the afternoon or mid-morning go visit Sesriem Cantyon. There are a number of dunes in the area. This is a 6 hr and 35 minute drive. 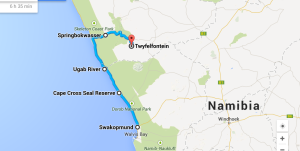 It would be advisable to stay in Twfelfontein as it is half way towards Etosha National Park. 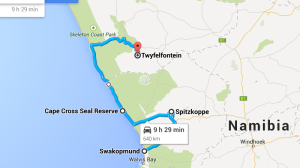 It is a 3 hour drive from Swakopmund to Park Entrance where you need to be by 3:00 pm to pass. 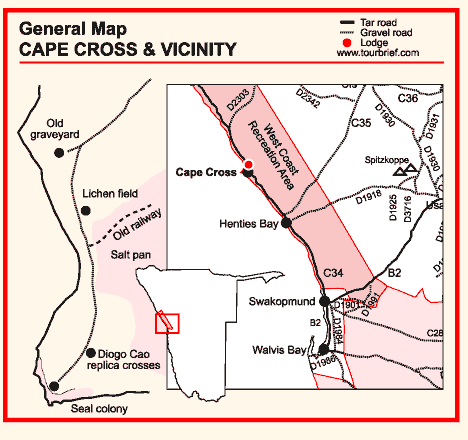 If you assume that you will spend 30 minutes to 1 hour at Cape Cross Seal Reserve. 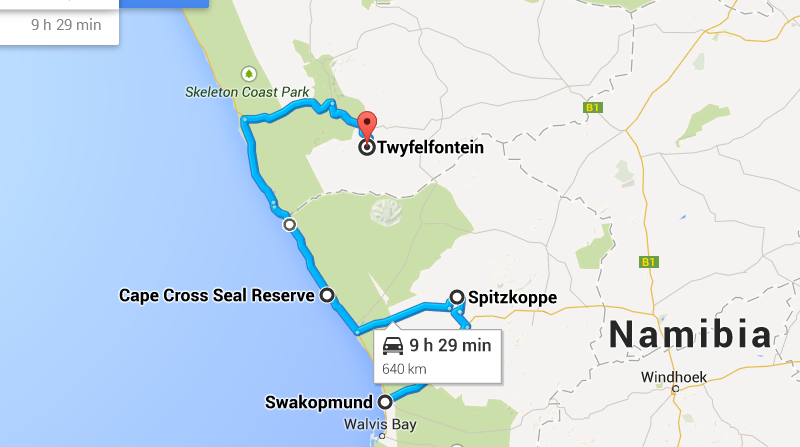 You really need to leave Swakopmund by 10:00 to 10:30. This might make doing a scenic flight in the morning difficult. Number of articles exist on TripAdvisor talking about best route (North of Swakopmund or south over Sossusveli); All people recommend this experience. There is big seal colony at this location. It is also the location of where European explorers first landed. How much time to spend here? : It is suggested to spend only 1 hour or so at the site. 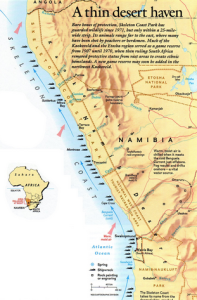 Option #1 – Is there scenic flight in Swakopmund in the morning? How much time to spend in area? You could easily spend 4 – 5 hours if you plan to do a lot of hiking in and around the area. If you plan to do only minimal hiking then you are talking more like 2 – 3 hours. Potential places to stop include the Ugab terraces and Vingerklip. You can do a self drive tour. How much time to spend in Etosha? : Most people indicated at least one full day in the park. Many will spend either another half to full day in the park. What vehicle to drive? : It is possible to drive a 2 x 4 vehicle. When to go? : June to August is high water season and is the best opportunity for boat and canoe safari. This is the best time for safari. How to get there? 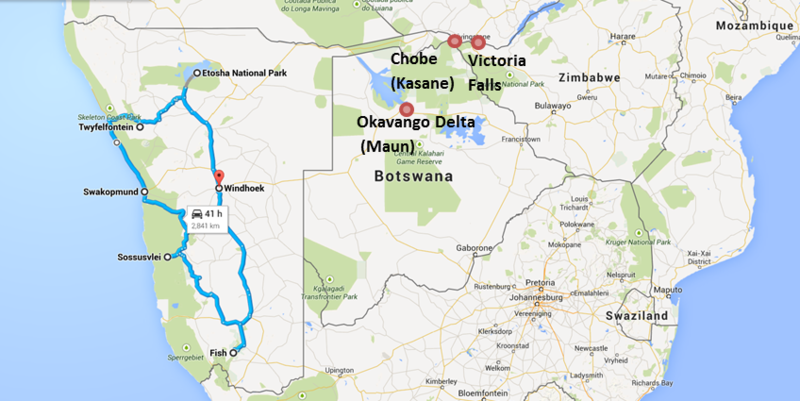 : It is possible to drive to Maun from Windhoek, which will take 10 hour 15 min. Most car trips will break it into two days. The quickest option (not the cheapest) is to fly to Maun on Air Namibia. The hour long flight leaves on Mon/Wed at 9:15 am and on Fri/Sun via Victoria Falls that departs in the afternoon. The one way flight costs ~$350 USD. How much time to spend there? : I think the most common length is 1.5 days. The most common option that I can see from organized tours is the first half day is when a scenic flight occurs with the second day being out on the water. The most that I saw on the delta was 2.5 days. There is the ability to take 3 day / 2 night houseboat tour. You will take canoes deeper into the brush. One should try and go into the Panhandle. How to get there? : Kasane is the main base of location. One way would cost ~80 from Maun to Kasane on Air Botswana. Plane only flys on Tuesday and Thursday in the morning. How long to spend there? 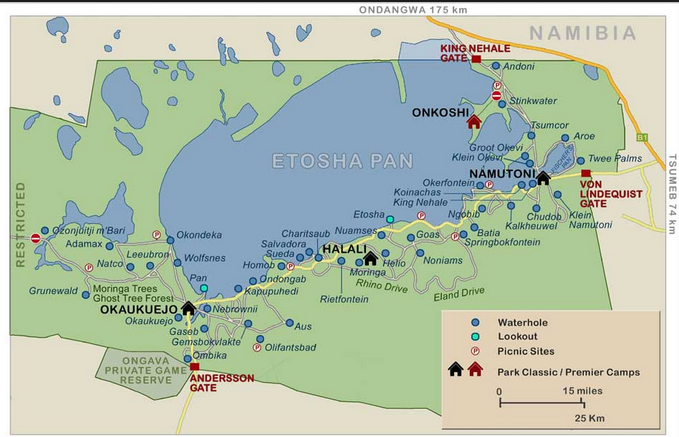 Most people only spend 1 day in Chobe National Park. You can do a sunset cruise and/or game drive. It seems most people only do 1 day max in Chobe. They spend more time in Delta. Victoria Falls straddles both Zambia (2/3 of falls) and Zimbabwe (1/3 of falls). You can hike to bottom of falls on Zambia side, but you get better perspective of falls from Zimbabwe side. There will be visa charges if you see both sides of the falls. It will cost under $100 to see both sides of falls. How to get there? : There are buses and shuttles that will take you between locations. Taxi/Bus will likely drop off you on one side of the border. The cost should be under $50 one way. Can one go on scenic flight in the morning in Swakopmund?